"I feel it is my duty to report Dallas'' roots as I know it and do it with mystery and beautiful color." From one commissioned painting evolved this pictorial history of Dallas from the 1950s through the final decade of the 20th century. The artist is a woman, Pat Wheelis Kochan, a native of Dallas, whose love for this city is nurtured by her fond childhood memories of a time when people went "downtown" for shopping, doctors' appointments, dance classes and entertainment, just to name a few. 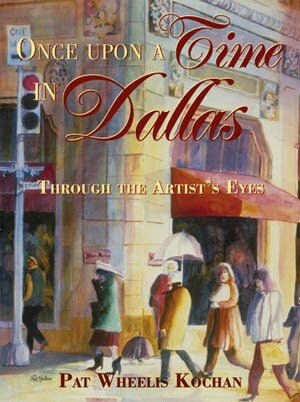 Included in this series are nostalgic paintings of buildings that were a major influence on the people of Dallas. Some of the buildings no longer exist. Some have been saved, thanks to preservationists. "Paint who you are....I am a city girl so I paint the city and it's people." Price through Pat is $50 tax included.